Explore two custom home opportunities from Prewitt Custom Homes in Sanford’s Autumnwood. The popular Emilin II plan will be available on Lot 164 at 510 Boulderbrook Parkway. And Lot 124 at 107 Foothill Court will feature an exciting new plan called the Brady. 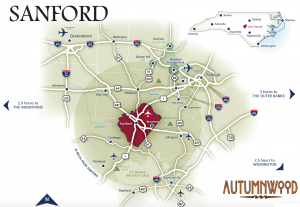 Quietly nestled between Highways 1 and 421, Autumnwood is only seven minutes to Downtown Sanford, 42 minutes to Research Triangle Park, and less than three hours to sun-drenched North Carolina beaches to the East and magnificent North Carolina mountains to the West. Autumnwood takes pride in terrific accessibility and in being a part of the charming Sanford community. To learn more, contact Prewitt Custom Homes at (919) 669-1969.